Sarah has always been on the move. Her mother hates the cold, so every few months her parents pack their bags and drag her off after the sun. She’s grown up lonely and longing for magic. She doesn’t know that it’s magic her parents are running from. When Sarah’s mother walks out on their family, all the strange old magic they have tried to hide from comes rising into their mundane world. Her father begins to change into something wild and beastly, but before his transformation is complete, he takes Sarah to her grandparents—people she has never met, didn’t even know were still alive. Deep in the forest, in a crumbling ruin of a castle, Sarah begins to untangle the layers of curses affecting her family bloodlines, until she discovers that the curse has carried over to her, too. The day she falls in love for the first time, Sarah will transform into a beast... unless she can figure out a way to break the curse forever. It's been a while since I've read a fairytale-esque fairytale retelling. Beastkeeper certainly fits the bill, with a story about curses and family and love and ever-afters. 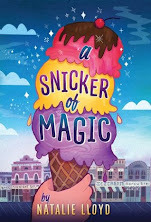 I was a bit confused at first as to why the author would choose to write this story for middle graders rather than young adults. After all, we're talking about a thirteen-year-old girl and a curse based on love. Can thirteen-year-olds really fall in love? If they do, is it really appropriate? These were my thoughts as I was reading the story, especially after Alan came into the picture. But, after finishing the story, I get why the author choose to make her heroine so young. The love in this story isn't just romantic love... and having a younger narrator actually helped make certain parts of the plot more intricate and interesting. While this is not a straight retelling of a standard fairytale, Beastkeeper probably has the most in common with "Beauty and the Beast", with the original beastly curse coming about because of vanity, jealousy, and retribution. I like that the curse in this book is multi-generational. Sarah was just as vulnerable to the original curse as her father and her grandfather before her. Fair or not, it's an interesting take on the concept. I really like most of the characters, even our thirteen-year-old heroine. Middle-grade narrators can sometimes be a little hit-or-miss. If they're not done quite right, they can come across as sounding like stilted little adults... which isn't very believable. But Sarah manages to sound both young and modern, while also keeping within the fairytale flavour of the book. She doesn't use jarring jargon that might pull a reader out of the atmosphere of the story. The villains are also complex and nuanced, with good reasons for acting the way they do. One of them, especially, is one that readers are bound to love... if only because she's so easy to hate. The writing in this book is also very lovely: lyrical, evocative, and colourful, without straying too far into purple-prose territory. Some of the settings are so vividly described, with such wonderful little details, that I could easily imagine all aspects of them: the scents, the sounds, the sights... even the temperature. It really works well in a book with such a magical setting. The one thing I wasn't crazy about was that the ending felt a little bit rushed, and I wasn't sure why one character had a particular outcome (unless it was simply for shock value). A few more pages to flesh out the ending might have been nice... though I don't think I would have actually changed what happened. It's a pacing issue more than anything else. I was also a little confused by the terms of the curses... though I may just need to go back and reread the explanations. Aside from a couple of continuity issues (which may have just been sloppy editing), the writing in this book is pretty strong. I don't have many complaints. 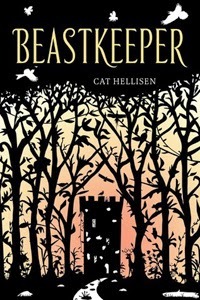 Beastkeeper is a lovely addition to the fairytale retelling genre, perfect for fans of old-fashioned fairytales and more modern fantasies alike. Even though it's technically in the middle grade category, I wouldn't hesitate to recommend it to fans of young adult books. It's perfectly suitable for older readers as well. There was a long silence, drawn out and stretched like a strand of bubblegum. Sarah tiptoed along the landing toward her parents' room and wondered what flavor silence was, and if it grew hard and brittle if you threw it away, or if people sometimes stepped on wads of discarded silence and it stuck to the soles of their shoes and made their footfalls softer. She stepped on the silences, and padded fox-quiet. I was a big fan of this author's YA - When the Sea Was Rising Red. I have to admit I was a little surprised to hear that she was writing YA. But I definitely want to try this. I'm not familiar with any of her other work... but if it's as good as this one was, I might like it! I always find it really interesting when authors use younger narrators in their books - it either ends really well or really badly. And then the language is tricky for them to get right, you know? Hit or miss really. Yeah, my previous read was like that. The words that were coming out of the kids' mouths made them sound like little adults. It was quite noticeable... and pretty annoying. I just started reading this book this morning and put it down because I was worried it'd be too young for me; I'm more a fan of YA than MG. Your review makes me want to give it a try, though - I don't want to miss out on a great book just because the first couple of chapters didn't wow me! It is MG, but don't let that stop you! Once Sarah has to start figuring out the curse and whatnot, the pace picks up a bit.